The Orleans Country Club has stepped up its food game this summer! We have now been to this restaurant a few times to try different things from their new menu – and while it consists of simple food, the flavor profiles are far from simple. This year, the restaurant at the Orleans Country Club has taken a decidedly upward turn. With new options, a choose your own flatbread menu, and incredible prices, they have made a statement on the local restaurant scene – add in a full bar and golf, and you have yourself a great place to spend the day! 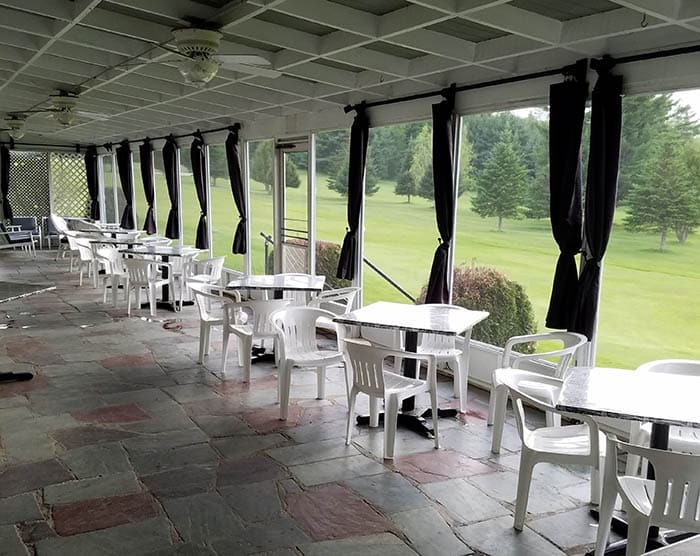 Now, I am not a golfer – nor am I a member of the Country Club, but the restaurant is open to the public and when we saw their new flatbread options we had to give them a try. The first time we dined at the Orleans Country Club we had to order a number of things. I was surprised by a few of their unique appetizers and how comfortable their bar was. 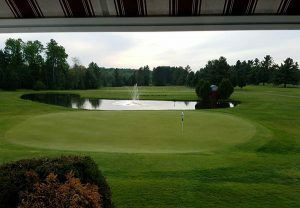 Now, over the years I have been to a number of country clubs as a guest, mostly out of state. For many, “country club” brings to mind an image sporting posh, khaki clad golfers, money, and maybe a touch of snoot – but this is the Kingdom folks and this Country Club has stayed true to its roots (after all, there are local stories about how the course was once a cow field to the entertainment of many of its members). On entering the club house you are greeted with expansive views of the course and property beyond due to the wall of glass at the back. You immediately walk into the bar area which has an airy feel, is bright, and tidy. It is immediately very welcoming. To the left is a door leading out to a screened in patio with a number of tables for outdoor dining. To the right of the bar is the more expansive dining room with plenty of seating and enough space for weddings and events. Back in the bar, a few televisions offer the latest golf event – and sometimes other sports or news. The first thing that jumped out at me from the menu was the buffalo chicken rangoons! We also ordered the sweet chili chicken wings from the menu and the salmon cakes from the specials board. While we waited for our apps, cocktails were in order – a cosmopolitan and a martini (of course). On this visit, our server was also bartending and was unsure of making these cocktail so we helped her out, not bad for her first time making both! The rangoons are a must try! I don’t like a lot of heat – but having the spicy chicken paired with the cream cheese filling was a perfect combination set off by the fried, crunchy outside. 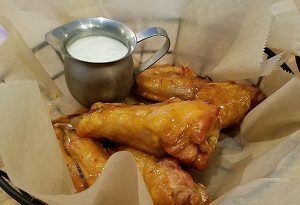 I gave the chicken wings a try, and found that the sweet chili sauce was too hot for me. It started out sweet with a full bodied flavor. The heat came after, slowly building as you swallow – as chili powder should do. 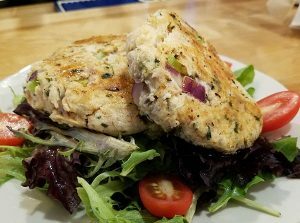 I was also impressed with the salmon cakes. This is something I haven’t seen at local restaurants and, as a salmon fan, I was happy to try it out. With the addition of red onions, plenty of spices, and a gentle binder, these cakes were full of flavor. There was very little filler or bread crumb which helped let the salmon remain the focus. For dinner we had to try a few different flat breads (so much of this went home as leftovers). I ordered the chicken pesto, my husband ordered the BBQ Chicken, and we tried a spinach and mushroom combo that was on special. The chicken pesto was the highlight of the evening. Instead of tossing the chicken in pesto, as I have eaten at other restaurants, the sauce was instead spread on the flatbread. Cheese was sprinkled over that, and grilled chicken slices were laid over the top. This preparation allowed for the taste of basil to shine, brightening the dish. 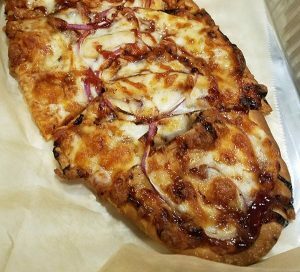 I am not a fan of BBQ Chicken pizza – but it is a favorite of my husbands. He thoroughly enjoyed this flatbread rendition and had to order it again the next time we came in. The spinach and mushroom special was another great addition, providing an earthy flavor. The crisp crust on the flatbread kept it from being too soggy in texture. And, just to top off all of this delicious food, we put in an order for their burger! 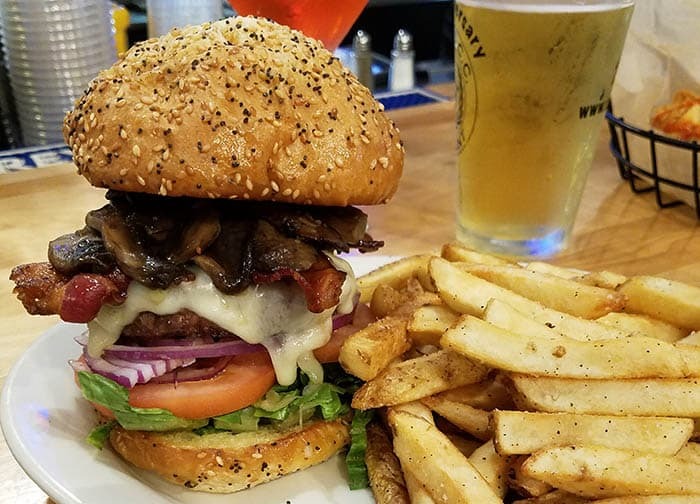 A towering presentation was brought to the table – and on first bite it was obvious that the burger was fresh. Piled with veggies and well melted cheese, this dish is a crowd pleaser. Three apps, three flatbread pizzas, a burger (a stack of carry out containers), and a few drinks later and we were ready for the check. We were happily surprised by the total which, with tip, was about $100. Just about everything on the menu is under the $15 mark, and flatbreads vary depending on how many toppings you want. The Orleans Country Club is a great place to grab a delicious, inexpensive, yet enjoyable meal in a relaxing setting. 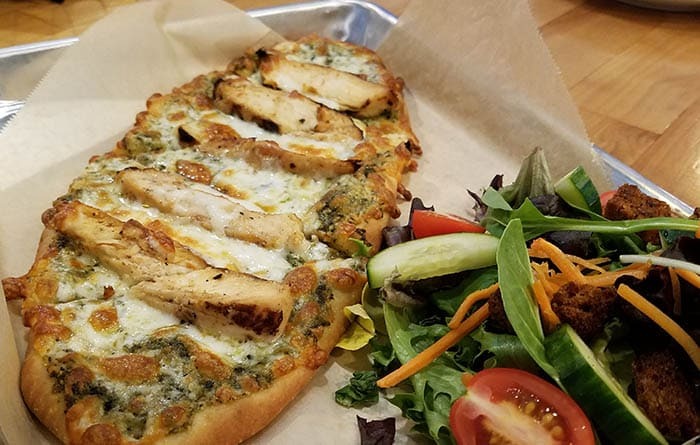 There are enough options on the menu to enjoy multiple visits, with flatbread pizza specials throughout the week and a build your own flatbread menu Friday and Saturday. I highly recommend giving this place a try!